Hungary’s Orban’s plan for Europe; Might Spain be inclined to support it? …I have formulated five tenets for the project of building up Central Europe. Viktor Orban has long been a critic of Muslim immigration. Now we should ask ourselves why the European elite – which today is exclusively a liberal elite – has failed. To recap that in other words, Viktor Orban is saying his government got the Hungarian constitution changed to embrace his view of Christianity and this is working. He blames the turning away from that on a continental basis for Europe’s problem. For the future, he believes Europe should embrace the Greco-Roman version of Christianity as the best way forward. And that immigrants who do not share those values are not what Europe needs. According to Wikipedia, Hungary is about 50% Catholic and 28% Protestant. While Vikor Orban mentioned Central Europe a few times, his views are not unique to that region. The Vatican has long been pressing for its version of Christianity to be a greater part of Europe. So have other leaders in Europe (see Germany’s Dobrindt decries Islam after France’s Macron promotes Catholicism: Steps towards a new ‘Holy Roman Empire’?). Not even two months after taking office, Spanish Prime Minister Pedro Sanchez is facing his first significant political crisis. Last week, dramatic images of hundreds of African migrants jumping over the Ceuta border fence rocked public opinion. According to the Spanish Association of Civil Guards (AEGC), 22 police officers were injured in the assault, which ended with 602 people successfully reaching the Spanish exclave in Northern Africa. Meanwhile, the newly elected president of the conservative People’s Party (PP, the largest opposition party), Pablo Casado, adopted a distinct anti-immigration position last Sunday. Casado tweeted that “millions” of Africans are waiting to cross over to Europe. “There can’t be papers for all,” he tweeted, adding that “we have to say it even if it’s politically incorrect.” Three days later Casado travelled to the south and was photographed shaking immigrants’ hands. So, some are anti-immigrant, but some are also pro-immigrant. Europe will change: a reorganized Europe is prophesied (Revelation 17:12-13), it will develop a ‘great army’ (Daniel 11:25), betray its ‘friend’ (Lamentations 1:1-2), destroy the USA (Daniel 11:39), and destroy a power based in the Islamic-dominated lands in the Middle East and North Africa (Daniel 11:40-43). What about a Greco-Roman religion? So, he felt that while they needed a political-military leader, some type of religious leader was needed to unify Europeans. This is consistent with Viktor Orban’s call for a ‘Christian foundation’ for Europe. The final European Beast leader (Revelation 13:1-10), who is also known as the final King of the North, will ultimately promote his religion (Daniel 11:36-38; which will not be Islam, he will at first feign and claim a form of Roman Catholicism), destroy the USA and its Anglo-Saxon allies (Daniel 11:39), and then takeover the predominantly Islamic nations in the Middle East and North Africa (Daniel 11:40-43). Islamic issues will be a factor in the rise of this Beast leader. A “Holy Roman Empire” would be one with Greco-Roman Christianity. Historically, that has involved the Church of Rome and Europe. Such an alliance is prophesied in Revelation 17. Throughout the Middle Ages, leaders considered the Church at Rome to be God’s chosen instrument in spiritual matters. The Holy Roman Empire was regarded as God’s chosen political organization over Western Christendom. Pope and Emperor were regarded as God’s vice-regents on earth. This intimate alliance of Church and State served the needs of both institutions. The Empire exercised its political and military powers to defend religion and enforce internal submission through religious uniformity. The Church, in turn, acted as a glue for Europe, holding together the differing nationalities by the tie of common religion. This ideal in Church-State relations was never completely realized, as we have seen in the frequent conflicts between Emperors and Popes … numerous revivals of the Roman Empire have arisen in Europe in the centuries since the fall of ancient Rome. In Revelation 17, these revivals are represented by the seven heads of a wild animal. Six have already occurred, from Justinian to Mussolini. One last restoration of this great political system is yet to arise. This confederated Europe will be an immense political, military and economic power — a great Third Force in world affairs, a superpower in its own right. Prophecy further reveals that this powerful church-state union will be composed of “ten horns” — meaning 10 nations or groups of nations (Rev. l7:3) — under the overall leadership of a single political figure (verse 13). Europe will again have a single political head of state! Steps towards such an alliance are taking place now. In addition to biblical and Church of God predictions about this, Roman Catholic prophecies also predict this as well (see The Great Monarch: Biblical and Catholic Prophecies). 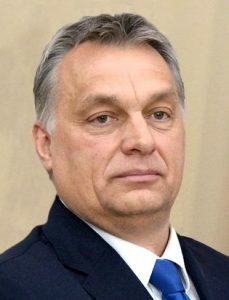 Although not all of what Viktor Orban and others want will be realized, combining Greco-Roman religion with European politics will come to pass. Biblical prophecies will be fulfilled. Steps are in progress. War is Coming Between Europeans and Arabs Is war really coming between the Arabs and the Europeans? What does Bible prophecy say about that? Do the Central Europeans (Assyria in prophecy) make a deal with the Arabs that will hurt the USA and its Anglo-Saxon allies? Do Catholic or Islamic prophecies discuss a war between Europe and Islam? If so, what is the sequence of events that the Bible reveals? Who does the Bible, Catholic, and Islamic prophecy teach will win such a war? This is a video. This entry was posted on Friday, August 3rd, 2018 at 2:30 pm	and is filed under Prophecy.